Flowers 3" across, petals lightly rolled like seashells in creamy and pastel white, pink, rose and carmine. 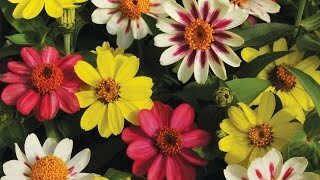 Bright, colorful daisy-like blooms on tall stems with ferny leaves. GARDEN HINTS: Tolerates poor soil, heat and drought. Sow directly in the garden, where you want them to grow after last spring frost. Grows best in full sun. Cosmos, Seashells Mix is rated 4.0 out of 5 by 4. Rated 3 out of 5 by MileHighGardner from Unique flower, but low germination late bloom Beautiful unique flower. However, I had 15% germination and it was late Sept. before it bloomed. If I did it again I'd start indoors. Rated 3 out of 5 by Sally J from so tall! The seashell cosmos has unusual petals. They start like little tubes and then open. The plants grew extremely tall in my garden, however, and became a bit of a hazard, leaning on each other and falling to the grass. Rated 5 out of 5 by NorthJerseyGirl from Great Cosmos! I love the fluted blooms of these cosmos. The germination rate was excellent and the flowers were so fabulous. I am hoping they reseed so I'll them again next year. Rated 5 out of 5 by GardenGirl88 from What a Look These are such fun-looking flowers, I had to try them. They were very easy to grow from seed in the garden, and had about 95% germination in our cool, wet spring. They are loaded with flowers and look nice interplanted with the double click cosmos and some bachelor buttons. I'm allowing them to go to seed so they can take over the garden they are in for years to come. They reseed themselves easily. Be sure and deadhead faithfully if you don't want volunteers next year.